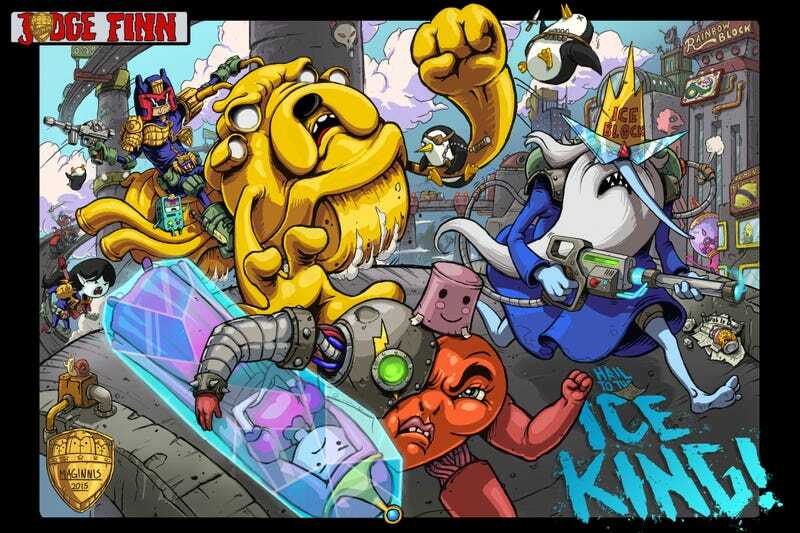 What do Judge Dredd, Mad Max and Adventure Time all have in common? They’re three of the best post-apocalyptic narratives we’ve ever seen. And they’re all slightly ludicrous, ranging from outright surrealism to mad social satire. In fact, the best post-apocalyptic storytelling is usually kind of ridiculous. When you think about it, post-apocalyptic stories aren’t about the apocalypse or the fact that most of the human race has died—they’re about what’s left after a horrible calamity. And the shape of what’s left reveals something about what was there to begin with. The apocalypse is often a kind of “scratching the surface” that strips away our artificial social structures, and the way that this is depicted takes on a political and sociological dimension. And there are two ways to approach that post-apocalyptic simplification, which aren’t mutually exclusive. One way is to show that the apocalypse brings out the worst in people, returning us to a “nasty, brutish and short” way of existence. Often, this involves reasserting patriarchal ways of behavior, including lots of brutality and outright enslavement of others. The other way is to depict the collapse of civilization as a kind of reductio ad absurdum, showing that society always was absurd, because people are absurd—and when you take away our cars and cities and technology, we’re still going to create bizarre, nonsensical social structures. Like I said, these two ways of looking at a world after the apocalypse are not mutually exclusive. And in fact, they often go together to some extent. But the first way is fundamentally conservative, because it assumes that patriarchy and exploitation are the “natural” forms of human behavior, to which we’ll revert the moment we don’t have the legal system and the courts and birth control and computers to enforce an artificial way of acting. The second way, though, is essentially subversive—and if anything, it shows that there’s no “natural” way for people to behave at all. Whatever we do is going to be crazy and nonsensical. And maybe that’s the point—there’s something fundamentally absurd about continuing to live when most of the human race is dead. Life and death are absurd concepts to begin with, but they become even more absurd on such a massive scale. And usually, the people who survive these catastrophes are the most unlikely, and therefore the silliest, choices. What’s great about stories like Dredd, Mad Max and Adventure Time is that, in their own ways, they heighten the craziness of life after a world-ending catastrophe and fully invest in the extremeness of societies cobbled together out of the ashes. Judge Dredd’s Mega-City One is a bizarre parody of a late 20th century city, full of completely ridiculous cultural and political phenomena, and it’s like a distorted mirror on our world that’s only rendered more of a barbed satire by the fact that the human race is dying out. Mad Max’s weird strongmen, with names like Lord Humungous and Immortan Joe, seem almost too weird to take seriously, but they make you stop and realize how unserious most authority and systems of social control are in the real world. And Adventure Time’s brightly colored, fantasy-tinged post-apocalyptic world is entirely lovable, except for when you get glimpses of the “mushroom war” and of the weirdness of a magical fantasy kingdom coming out of something like that. Anyway, not all post-apocalyptic stories have to be absurdist or silly—but a surprising number of the best ones are. And the ones that aren’t are usually saying something kind of retrograde and horrible about human nature. So get off The Road and climb onto Lady Rainicorn’s back, people! Charlie Jane Anders is the author of All The Birds in the Sky, coming 2016 from Tor Books. Follow her on Twitter, and email her. Top image: Judge Finn by Kevin Maginnis/White Out Collective. Second image: Judge Dredd: Mega City Two.